Over the last years Michele Quondam and his publishing house GIOCHIX.IT have given us some perfectly developed games for strategically orientated players. 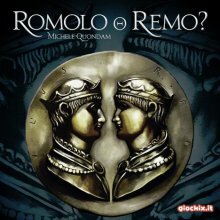 His newest game is named after the central characters of Rome's foundation: Romolo o Remo. Next to the two famous brothers, two more players can take the role of Kings of new cities in the Italian region of Latium to fight for control of the whole region and to become the true founders of the new civilization that will soon after rule the whole world. So after Gladiatori the author thematically stays in the time of the Roman Empire. 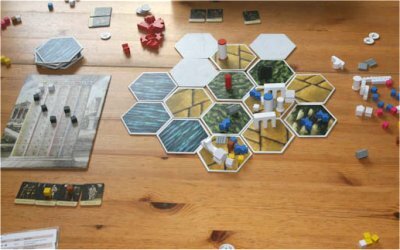 During set-up the territory which forms the playing area is formed by hexagonal landscape tiles. For each player number there is a given pattern of the landscape in which the tiles must be arranged. Each player starts with three landscape tiles around his capital already revealed, and the rest of the land is hidden, i.e. the landscape tiles lie face-down. As they are randomly drawn, no one knows the type of landscape under the hidden tiles, and so the exact structure of the territory differs from game to game. Principally this could result in an advantage for the one or other player, but since all four different types of landscapes allow the players different possibilities to build and produce, this only influences the strategy a player must follow to win the game. Indeed, in all my playtesting rounds the territory did not essentially influence the chances of a player to win the game. 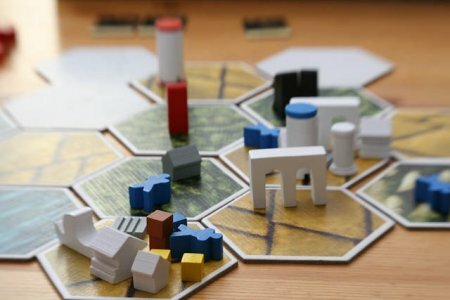 In addition to his capital, each player also begins the game with some workers, a tower, a farm and a warehouse which must placed on his three landscape tiles as he likes. During the game additional workers, soldiers, mercenaries and explorers can be acquired. Most of these game pieces have two actions per round. Of course, movement is one of the important actions, because it is the only possibility to expand your empire. But, other than most players might be tempted to think, it is not wise to expand an empire too fast. So it is often enough to expand your capital by just three or four landscape tiles in order to build up an efficient empire. One of the main reasons for this less expansionistic approach is that half of the buildings positively influence the harvest or the possible number of buildings on a neighboured landscape tile (but not further), so it is wise to expand as compact as possible. As said, at the beginning of the game most of the land is unexplored, and so it must first be explored before anyone can set foot on it. In this context an interesting rule called the "river rule" is used. Whenever a player finds a water tile, he has to check if there is only one other unexplored landscape tile adjacent to this water tile. In that case, this landscape tile is also turned into a water, independent what type of landscape it is (the landscape tile is exchanged for a water tile from the stockpile). If this condition is met again, it can result in the development of another river tile and so a big river can be created. Of course, this can strongly interfere with a player's plans, but I like this clever rule because it is helps to develop the river as a mayor landmark for the country. At the SPIEL '13 fair it seemed that Michele is very proud of this rule and I think he can be because the development of the river is partly controlled by the players by revealing other landscape tiles. This way the river can be "directed" into the one or other way. Next to the movement of the workers, soldiers and mercenaries, the players can construct new buildings and produce resources. There are many different building types like a farm, a temple or a quarry. All these buildings give us benefits like a higher production or supplies for our units. With the production actions we can produce resources, depending on the type of the landscape tile and altered by buildings on that landscape tile, at least if there are any. Those resources are necessary for the construction of the buildings. Some also are used to supply mercenaries, who are easier to build than normal soldiers. In addition, resources can also be traded at a market. After all players have taken their actions a combat phase can take place on landscape tiles where armies of more than one player come together. In this phase the units on the same landscape tile fight against each other. For determining the outcome of the battle, a simple but effective mechanism is applied to find the the superior army, with the outcome being influenced either by a die or a virtual die token. The use of the dice is much faster, but the virtual token offers more tactical decisions. In the following maintenance phase the players must supply their forces. If that is not possible, will loose some of their units. The game ends if only one player is left in play (in most cases this is the more difficult variant) or if some of the tokens are no longer available at the supply (because the rest is already in play). From my perspective Romolo o Remo could be considered to be a more sophisticated development of The Forgotten Planet from 2011. When I confronted Michele with this thesis, he seemed to be surprised, but despite the quite different outer appearance the games offer some similarities like the effect of walls, the allocation of energy/supplies to a player's units or the action phase in general. So, I think that that you will love Romolo o Remo if you liked the older game, but it would not do the game justice to stop with this comparison because Romolo o Remo is a much more complex game which has its own appeal. On first sight it may seem that there is nothing spectecular, but after a few turns you will see that the game gives the players quite a lot of possibilities to choose their strategy. As usual for a game by Michele, Romolo o Remo is highly tactical, and sometimes it even reminds me a bit of Chess. As a result, the game takes its time, and since the players start building their empires virtually from scratch you should expect a game length of 150 minutes or more. But here my vote is decidedly positive - it is worth every minute, not least because of the rather fulfilling implementation of the thematic background of the players warring to become the future rulers of Rome. The game can be played with 1 to 4 players. In the solo variant, there is a dummy player who continuously sends new military units towards the capital of the player. I think that this variant works well, but when you have become familiar with all the different units and buildings in the game it looses some of its charm. However, the contrary is true if you play with two or more players. The better the players know the game and their possible options, the more depth the game will develop. I think it is best with two players when you have a good balance between playing your own turn and waiting for your opponent to move. With more players, the military actions become more important, but sometimes it takes too much time waiting for your turn to come. Maybe a stopwatch would be a good alternative, but I have not tried it yet and it would certainly introduce a time limitation which was not originally intended. However, overall I was quite impressed by the playing depth and sophistication of Michele's new game, and I will gladly invest the time needed to become the future ruler of Rome. Remember: Rome wasn't built in a day!